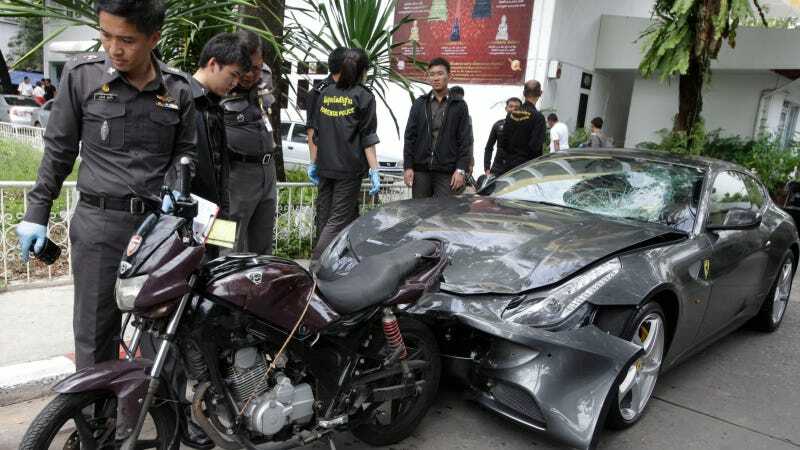 A year ago today, the heir to the multibillion-dollar Red Bull empire was arrested in Thailand after authorities said he killed a motorcycle police officer with his Ferrari FF and drove away after dragging the man down the street. Now, he's in even more hot water for failing to appear in court. CNN reports that an arrest warrant has been issued for Vorayuth Yoovidhaya, 28, after he didn't show up to court to answer charges of reckless driving causing death, speeding and failing to stop following an accident. Yoovidhaya is the Red Bull energy drink creator's grandson and co-owner of Thailand's Ferrari importer. An alleged attempt to cover up the crime — which involved police arresting a suspect who pretended to be driving his Ferrari at the time of the incident — led to the suspension of a police officer and sparked even more outrage. Yoovidhaya also allegedly paid the family of the victim Thai baht 3 million ($97,000) in a bid to stall a civil lawsuit, police said.